August is playing a trick on us. It’s usually a million degrees here, but between overcast skies, afternoon thunderstorms and temperatures hovering around 100 degrees, I’ve almost convinced myself that Autumn is right around the corner. 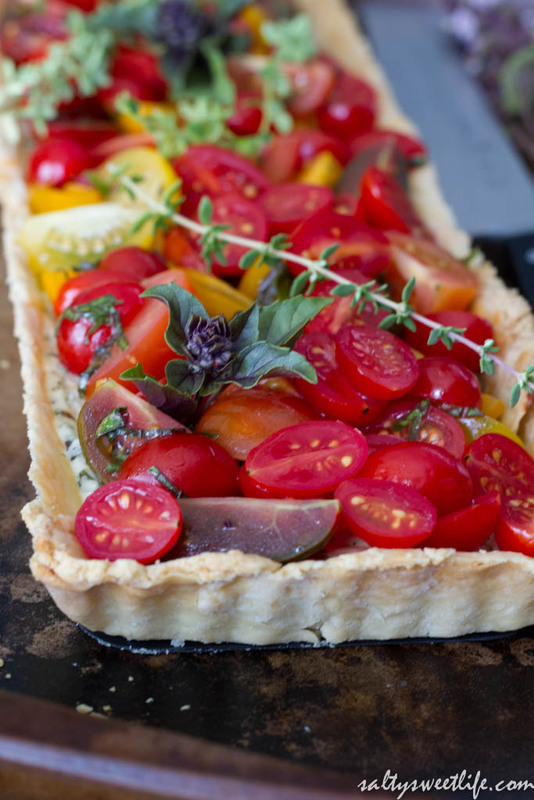 So pervasive was this thought that I actually turned on my oven and made this Heirloom Tomato Tart! I know I’ve been waxing poetic about heirloom tomatoes these last few weeks, but I cannot resist! Tomatoes are just so juicy and sweet and plump this time of year that I cannot help myself. Fresh tomatoes are here and we are stuffing our faces with them every chance we get! Before long, it will be October and all we’ll have are canned tomatoes or at worst, those awful mealy, off-season tomatoes at the grocery store! So, I hope you’ll bear with me for one more week while I continue to gorge myself with vine-ripened heirloom tomatoes! 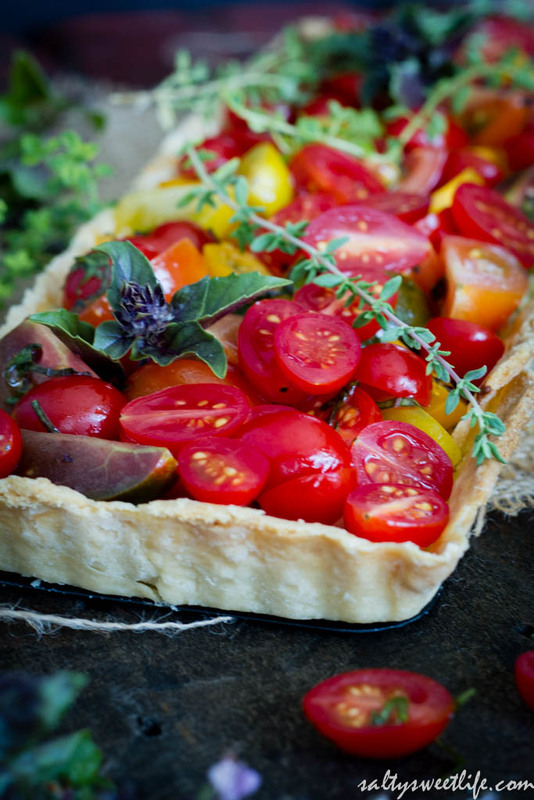 This tart was inspired by a dear friend and coworker who makes the most amazing comfort foods! She is the Queen of Cream; the Baroness of Bacon! Everything she makes is just filled with so much love and joy and butterfat (and oftentimes, bacon fat)! This dish was inspired by her very own crustless Ricotta Pie which I always look forward to when she brings it to the office! It is so decadent and rich and filled with creamy, ricotta cheese! She finishes it with roasted grape tomatoes, warm from the oven. I fully intended to follow her recipe, but I accidentally left the recipe at work, so, I had to improvise and I was so happy with the end result! I filled a buttery, flaky pie crust with a mixture of ricotta, parmesan and goat cheeses, fresh herbs, and garlic. In honor of these last days of summer, I kept it light and topped it with fresh tomatoes, a drizzle of olive oil, and fresh-picked basil! I used mini heirloom tomatoes from Trader Joe’s, but feel free to use your favorite type of tomatoes. This tart is perfect for brunch or a light lunch and I promise you won’t be sorry that you turned on your oven in August! I made this tart crust from scratch, but I will not judge you at all if you want to use a pre-made pie crust for this dish! Since I am far from an expert at making pie crust, I will tell you that I used this recipe from Martha Stewart, because if anyone is an expert in pie crust, it’s her! This recipe makes enough for two crusts. You can freeze the second crust for a future tart! For this tart, I used a 14″x4 1/2″ rectangular tart pan with a removable bottom and blind-baked the crust prior to filling it. My tart crust was far from perfect-looking…let’s call it “rustic”, shall we? Line a tart pan with the pie crust and press into the corners. Trim away the excess crust with a knife, but don’t trim it flush with the top of the tart pan. Leave a little extra at the top edge to account for any shrinkage. With a fork, poke holes in the bottom of the crust. Place the tart pan on top of a baking sheet. Place a piece of parchment paper over the top of the crust and weigh it down with dried beans or pie weights. Bake in the oven for 25 minutes until the crust is lightly browned. Remove the crust from the oven and remove the parchment paper with the beans. Set the crust aside. While the crust is baking, make the filling. In a medium sized bowl, stir together the cheeses, the chopped basil and thyme, garlic, herb salt (or plain salt), egg and black pepper until smooth. Fill the tart crust with the filling and bake for 30 to 35 minutes until it is firm to the touch and not jiggly in the middle. Place the quartered tomatoes in a bowl and sprinkle with a pinch of Maldon Salt. Drizzle with a little olive oil and toss with a handful of torn basil leaves. 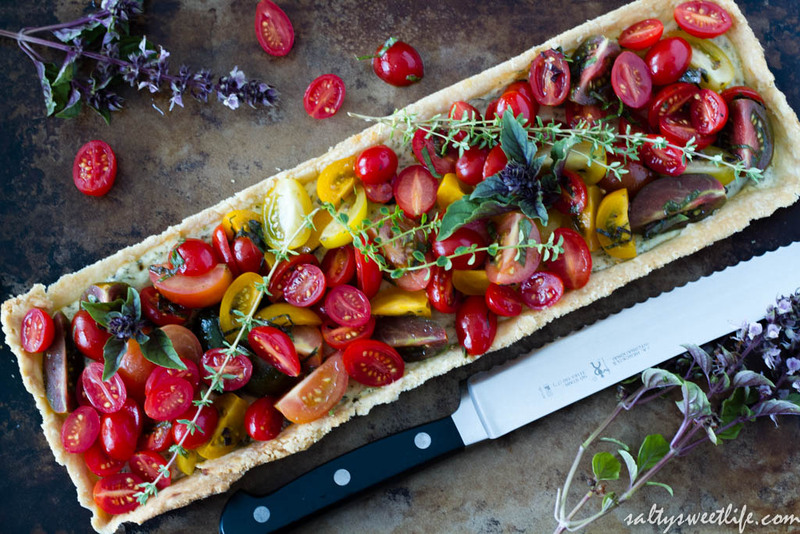 Distribute the tomatoes over the top of the tart and serve. This looks delicious! I love the combination of goat cheese with ricotta…thanks for sharing! Thanks, Jodee! I thought the goat cheese gave it a nice little tanginess! Thanks so much for stopping by! Holy COW this is so beautiful! Awesome Tracey! Thank you Erica!! That is so sweet if you to say! Thank you so much Kristin! So happy that you stopped by! Lovely dish! Great flavors and beautiful photography. Thanks so much Judy! I will definitely stop by this week! 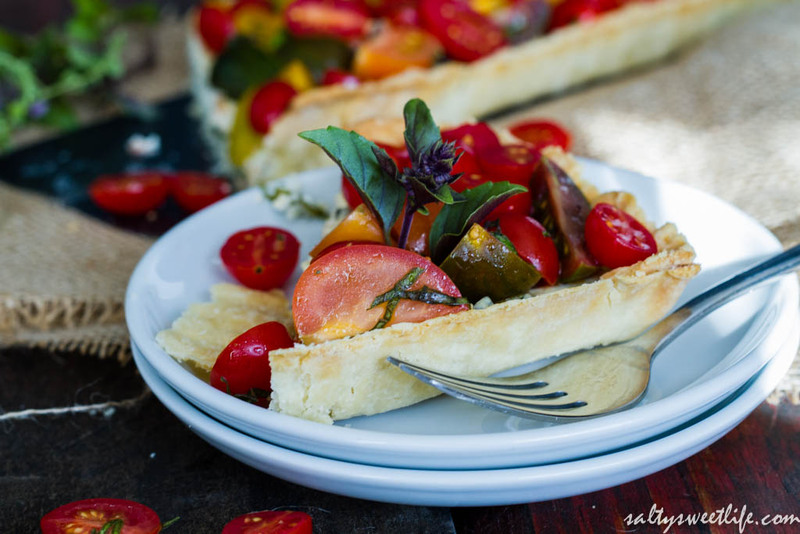 Congrats you have been selected to be my feature on #theweekendsocial for your recipe of Heirloom Tomato and Herbed Ricotta and Goat Cheese Tart ! I hope to see you tonight at 9PM EST! Oh my gosh! No way! Thank you so very much! And by the way, you really made my night! Thank you again for considering Salty Sweet Life! Previous PostHeirloom Tomato and Burrata Caprese Salad and That Time I Broke the Cat.